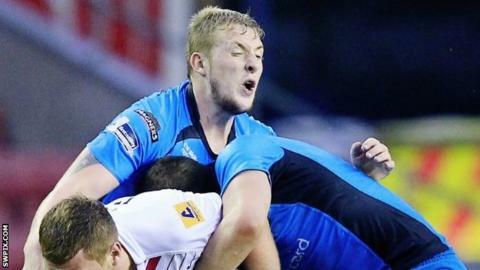 Teenage stand-off Jordan Abdull has signed a new two-year contract with Hull FC, following his first-grade breakthrough this season. Abdull, 18, has made seven Super League appearances for the Airlie Birds in 2014, since his debut against Wakefield in June. "I am really happy to be tied down at the club for a few more years," Abdull told the club website. Jack Logan, Brad Fash, Jack Downs and Jansin Turgut also signed deals. The emergence of Abdull in the Hull first team has been accelerated by coach Lee Radford, who has also brought Logan and Callum Lancaster into the squad this season. "Obviously I managed to make my debut this season, and I am looking to make more progress in the pre-season and make more appearances next year," said Abdull.